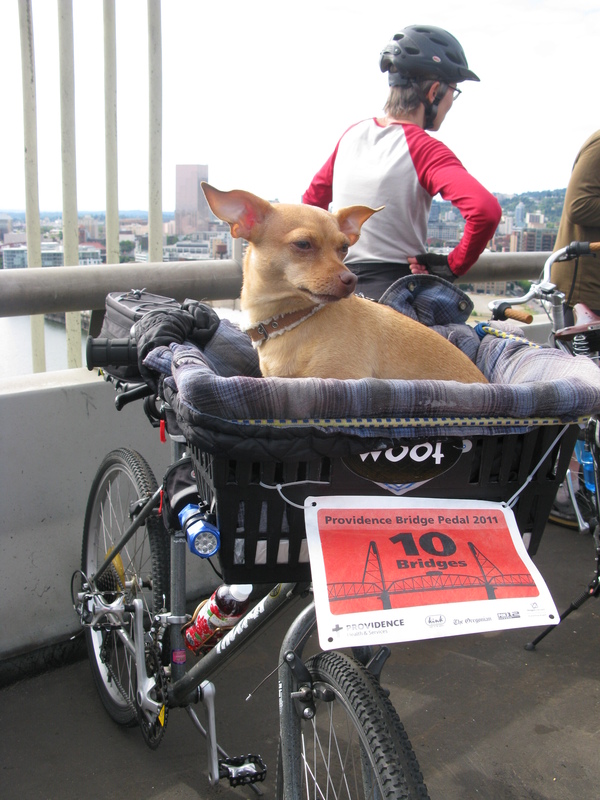 Counting calories makes for a vicious cycle in Portland, Oregon. Read all about it in the North Shore News! There was a time when bonding with my son Ryan meant getting on the floor and building a train track. He’s almost 15 and not really into that any more. Chances are he’s also not into having his dad land on top of him, soaking wet, in a 16-foot inflatable raft. But there we were, a chaotic display of arms, legs, neoprene wetsuits and lifejackets – a triumph of survival over style. The Elaho River has a way of breaking the ice like that. The night before we’d come to the Sunwolf Centre at Alice Lake near Squamish. In a cozy little cabin, we’d fallen asleep listening to the rain and the swollen Cheakamus River roaring by. It was still raining the next morning as we ate a huge breakfast at Fergie’s Café. 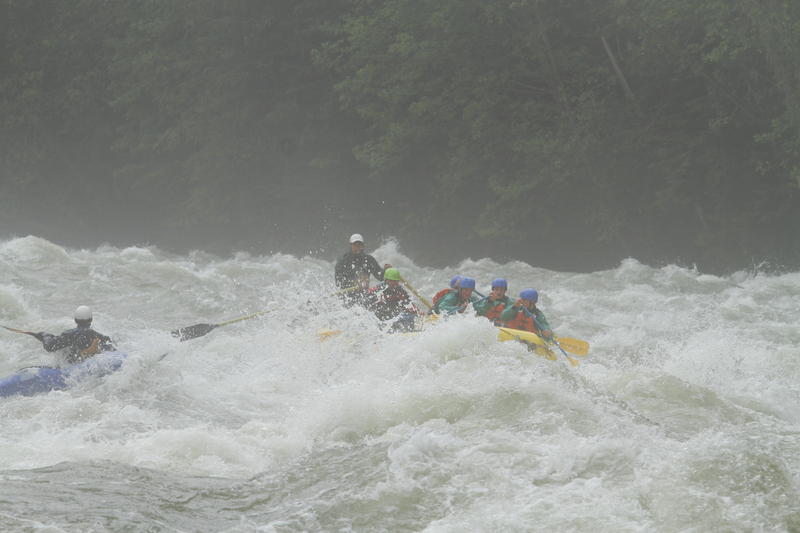 At the stern, guide Bob Vranich and his five-man crew navigate Class 4 rapids on the Elaho. “The water level’s up 40 per cent over yesterday,” says our guide Bob Vranich with a big smile. “It could get a little spicy out there today,” he adds. For a moment I wish Ryan and I were building train tracks again. During the hour’s school-bus drive north to the “put-in,” we glimpse the Elaho from the logging road. It looks angry, all foam and froth with some mist thrown in. It feels a bit like driving into a Lord of the Rings movie. 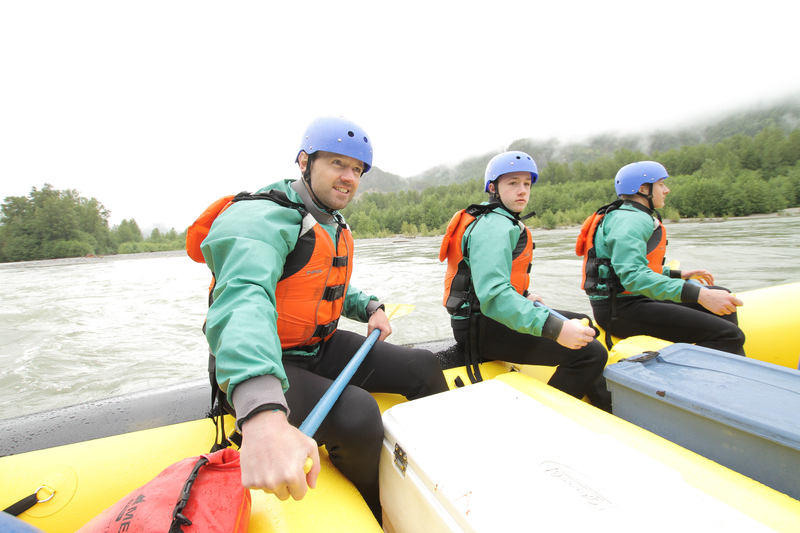 Long rapids; waves high, irregular; dangerous rocks; boiling eddies; best passages difficult to scout; scouting mandatory first time; powerful and precise maneuvering required. Demands expert boatman and excellent boat and good quality equipment. 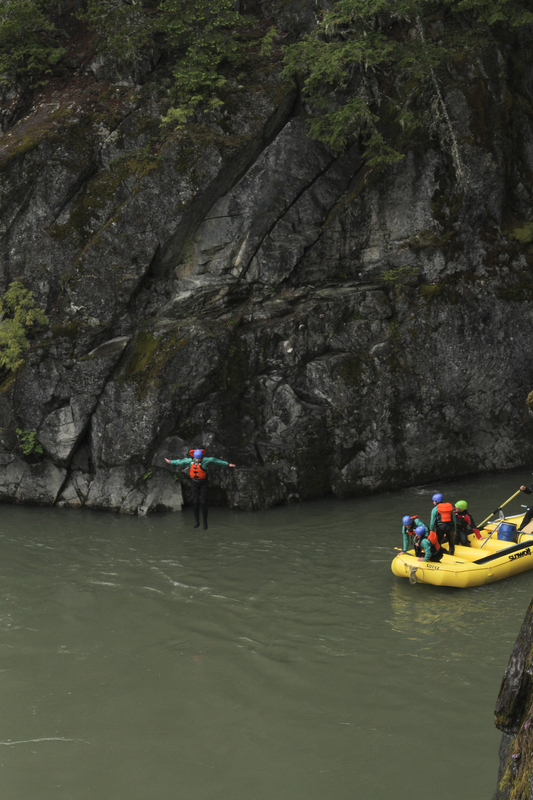 There are few more effective ways to wake up than leaping off a 40-foot cliff into the 4-degree waters of the Elaho River. More reassuring to both of us is Bob’s track record, and the fact that expert kayaker Bernardo Barajas happens to be a doctor and will be scouting and, if necessary, rescuing. Bob’s in his 10th year of endless summers – raft guiding in New Zealand and Chile during our winters, with spells in Switzerland, Guatemala, India and Nepal thrown in. He’s rafted the Zambezi in Africa, and last month was leading a tour through the Grand Canyon. He has also appeared in National Geographic movies and on Outdoor Life Network TV. After a lengthy safety talk on land and a quick paddling tutorial in an eddy, we’re finally in the thick of the waves, leaning as far out as we dare and paddling hard. Conditions on the Elaho change daily, and Bernardo is a little way ahead, scouting for debris and signalling to Bob the best passage. 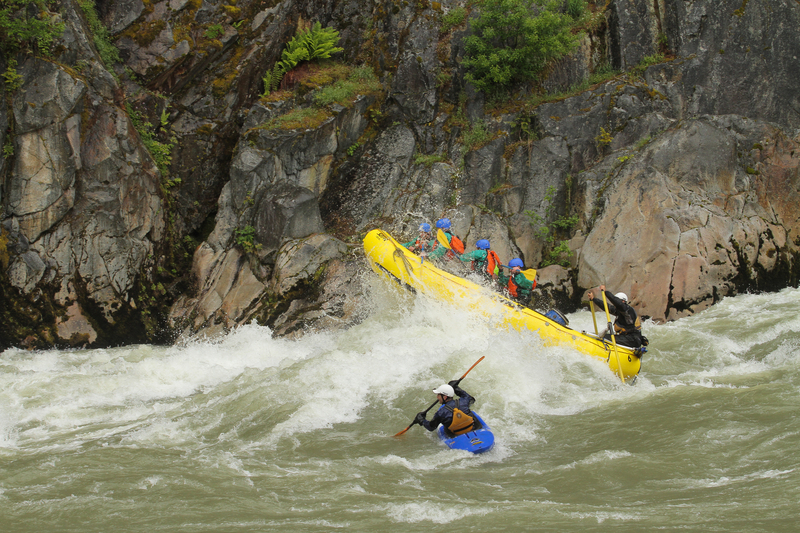 Five of us respond to Bob’s steady stream of commands and we paddle our way through Reflection Waves – a knockout combination of waves where the river pummels a vertical wall of rock and rebounds on itself. Then it’s on to Devil’s Elbow, where the river takes a jarring 120-degree turn to the right. I don’t think any of us expected conditions so intense, so soon, but Bob coaches us through the worst of it and into calmer waters. “This is awesome,” says Ryan quietly with a grin. 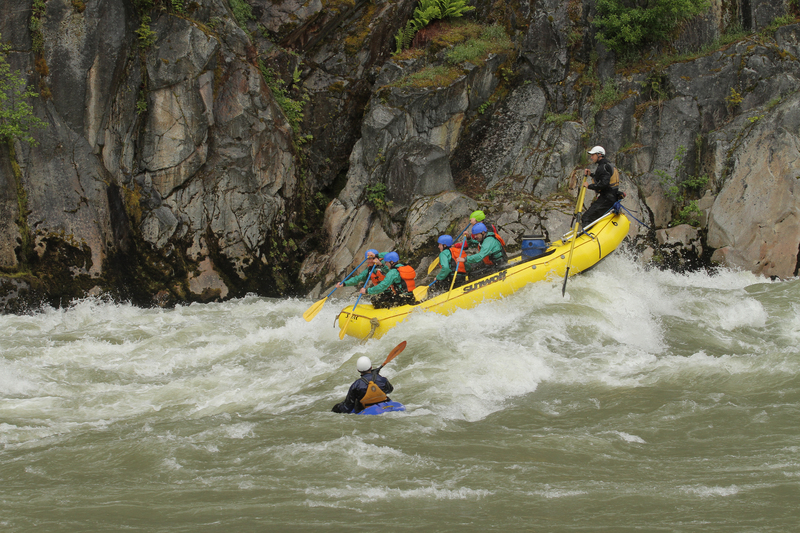 Bob wields two massive oars from the stern and steers us towards a large eddy and a cliff face where natural steps lead to a ledge about 40 feet up. Bob invites us to climb up and leap off the ledge. When I realize he’s not kidding, I follow Ryan and the others out of the boat and up to the ledge. I’m sure there’s a lesson about peer pressure here, but Ryan jumps before I can tell him. Legs shaking, I have no choice but to jump, too. Me and the boy – in our element. It’s breathtaking, charging all my senses and actually warming me to the core. I’m laughing as Ryan helps pull me into the boat and I fall on top of him. We’ve all taken the plunge and camaraderie replaces any lingering paranoia about falling in. It’s just as well because more challenging rapids are ahead. But first there’s time for lunch – barbecued wild B.C. salmon with salad, hot chocolate and a fire. On a sandy beach, Bernardo has everything set up for our arrival and we’re glad of the shelter as rain intensifies. The food is every bit as good as breakfast at Fergie’s and welcome fuel for the exertions ahead. On the second leg of our journey I begin to appreciate our surroundings. Above the cliff faces of the Elaho Canyon and far above the gnarled ranks of fir, hemlock and cedar are numerous silver streaks lining the Tantalus Mountains – waterfalls created by the incessant rain and snow melt. Bob points out Butterfly Falls, a cluster of waterfalls that on windy days evaporate before reaching the canyon floor. As the mist clears we glimpse the peaks of Mount Caley and Mount Fee. Later we glide past a wall of dirty snow two storeys high, the legacy of an avalanche that carried trees and boulders to briefly dam the river earlier this spring. This trip is equal parts education and adventure. The adventure returns and mounts steadily through House Rock, Playground, Cheeky Monkey and Little Steamroller – whitewater sections that climax in the main event, Steamroller. It’s the biggest rapid of the trip; a wall of water that Bob had earlier warned us would be as big as the boat is long. It doesn’t disappoint. After skirting an ominous watery hole atop Freight Train rapid, we manoeuvre left, and then right to hit an immense wave called Wu-Tang, head-on. Behold the Steamroller! Resistance is futile! As the boat crests we all seem to be paddling thin air before descending like a rollercoaster into a curtain of spray that drenches us all. We might have high-fived but for gripping our paddles so tightly. We’re soon back into rapids named 50-50, (“You don’t need me to explain why it’s called 50-50, right?” shouts Bob, laughing) Tombstone, and Aiden’s Alley. Somewhere in the mix, a wave catches us sideways and dislodges Ryan and me from our seats. Thankfully, we’re sent sprawling into and not out of the boat. Our final minutes of the trip are spent quietly floating through “the Braids,” a gentle stretch of the river punctuated by fallen trees and gravel bars. It’s a welcome rest. Back at the Sunwolf Centre, Ryan and I snack on goodies at Fergie’s Café and relive a day neither of us will ever forget. “We should do this again next year,” I say. “Let’s do it again next week!” says Ryan. A full-day Elaho River expedition costs $155 per person and includes lunch, post-trip snacks, full wetsuit and related gear, plus a professional guide. Participants must be at least 12 years old and weigh more than 90 pounds. For more information about the Sunwolf Centre and its other trips, services and accommodation, visit www.sunwolf.net or call 1-877-806-8046. More Eric Beckstead photos, click here.